We figured you might want some moral support while you made this creepy-looking (but tasty) Halloween treat, so we made a watch-along video for you! Add boiling water to peach gelatin mixes; stir 2 min. until completely dissolved. 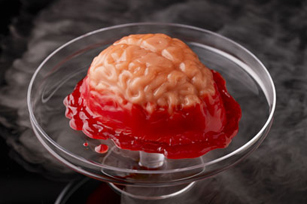 Stir in evaporated milk and 3/4 cup cold water; pour into JELL-O Halloween Brain Mold sprayed with cooking spray. Refrigerate 1 hour or until gelatin is set but not firm. Mix strawberry gelatin mix and cornstarch in small microwaveable bowl. Stir in remaining cold water. Microwave on HIGH 3 min. ; stir. Drizzle 1/2 cup strawberry gelatin between peach gelatin and edge of mold, gently pulling peach gelatin from side of mold as needed. Refrigerate 2 hours or until firm. Refrigerate remaining strawberry gelatin until ready to use. Unmold gelatin from brain mold onto plate just before serving. Microwave remaining strawberry gelatin 1 min. Spoon over the unmolded brain. When preparing recipe, be sure to use the small 5-oz. can (2/3 cup) of evaporated milk instead of the larger 11-oz. can. Prepare using 4 pkg. (3 oz. each) JELL-O Peach Flavor Gelatin. Allow gelatin to set several hours or overnight until completely firm. Before unmolding, dip knife in warm water and run knife around edge of gelatin to loosen. Dip mold in warm water, just to rim, for 15 sec. Lift from water and gently pull gelatin from edge of mold with moistened fingers. Place moistened serving plate on top of mold. Invert mold and plate and shake to loosen gelatin. Gently remove mold.